Women have been a part of SEIU since its inception, when Elizabeth A. Grady was elected Trustee at the founding convention in 1921. Grady often reminded her fellow executive board members, all of whom were men, “You men must know that you cannot get very far or make any real progress if you have women workers who compete with you, unorganized and working for less wages” (Union Sisters, p. 16). Indeed, the American Federation of Labor (AFL) was keenly aware of the importance of organizing women, demonstrated by correspondence found in the SEIU Historical Records. Amidst the correspondence are documents sent by AFL’s then president Sam Gompers, such as reports detailing labor’s organization of women in Europe during the 1920s, as well as questionnaires to AFL Internationals, generating data on women in industry. However, given SEIU’s initial gender integration, in part due to SEIU’s organization of flat (apartment) janitors whose wives were expected to share in the work, SEIU already recognized the importance of women in the labor movement. Indeed, while not always in the most visible of positions, women, both rank-and-file members, and those within SEIU’s leadership, have made great contributions to SEIU and the greater labor movement over the years. In honor of Women’s History Month, we take a look at some of SEIU’s more prominent female leaders. Elinor Glenn at the 15th General Convention in 1972. Arline Neal, president of Local 82, speaks before a crowd demonstrating against the World Bank in support of Justice for Janitors. Like Glenn, Arline Neal’s early career included the OPA and UPWA. In 1946 Neal began working at SEIU Local 82 as a clerk and quickly advanced to the position of Secretary-Treasurer, her career culminating in the Local 82 presidency in 1973. Over the years Neal’s community-mindedness lead to her participation in over 30 community organizations. Her service benefited people well beyond those in her local, all while Neal continued to serve SEIU and its members well. Neal organized strikes and combated racism through civil disobedience and service to the SEIU Civil Rights Committee in the 1960s. As quoted in Union Sisters (p. 19), Neal believed that, “you have to be a friend for the individual,” and it was this kind of leadership that was crucial to Local 82’s growth in the 1990s as well as the foundations of SEIU’s Justice for Janitors campaign. Neal’s story may be found in two of the Reuther Library’s Oral History Collections: Service Employees International Union Oral History Interviews and Twentieth Century Trade Union Woman Vehicle for Social Change. The progress made by Grady, Glenn, Neal, and their counterparts sped rapidly during the 1970s and beyond, as noted in the SEIU history book, A Need for Valor. The participation of women within the union, both its leadership and membership, became more pronounced beginning in this decade. Indeed, it was in the 1970s that many of SEIU’s female members and leaders rose to prominence or began their long careers with SEIU, including Karen Nussbaum, Anna Burger, Betty Bednarczyk, and Mary Kay Henry. SEIU District 925's final Executive Board meeting in Washington, D.C., 2001. Karen Nussbaum is third from the left. Karen Nussbaum and Ellen Cassedy founded Boston 9to5 in 1973 to organize women office workers. In 1975, Boston 9to5 joined SEIU as an affiliate, creating Local 925, and in 1981 through a merger with Nussbaum’s other organization, 9to5 (previously known as Working Women), SEIU District 925 was formed. Throughout its various incarnations, District 925 furthered the working women’s movement, influencing popular culture and making strides in the labor movement. During Nussbaum’s activism prior to establishing Boston 9to5, she met Jane Fonda, who was instrumental in creating the 1980 movie Nine to Five based on the organization. District 925’s influence was also felt within the union itself, demonstrated when SEIU created its Clerical Division, later rebranded the Office Worker Division in response to the needs demonstrated by the District. Nussbaum left the District 925 presidency in 1993, to become the director of the Women’s Bureau of the U.S. Department of Labor. She was also Director of the AFL-CIO Women’s Department, and later founded Working America. As for District 925, in 2001 it amalgamated into several SEIU locals. However, the organization’s legacy lives on through the District 925 Oral History and manuscript collections and the Service Employees International Union: 925 Image Gallery. Additional information on the Clerical Divisions’ organizing activities may be found in the SEIU Organizing Department Records. Anna Burger applauds during the 22nd SEIU International Convention in Pittsburgh, Pennsylvania during May, 2000. Anna Burger’s roots were also in activism. Burger began her career with SEIU in 1972, starting as a rank-and-file member and activist. Over the years she worked her way up through the ranks, elected as (the first female) president of Local 668 in 1983, and eventually became the National Field Director of the International. Soon after, Burger ran John Sweeney’s successful bid for AFL-CIO president, and served as a union trustee and as a negotiator for SEIU’s merger with 1199 NY. Shortly thereafter she was elected to Executive Vice President, and her career with SEIU culminated with her election to International Secretary-Treasurer in 2001. But Burger’s most impressive achievement came in 2005 as the chair of the newly formed Change to Win (CTW). In this position Burger served not only as the first chair of CTW, but also as the first woman to ever serve at the helm of an American labor federation. Burger’s contributions to SEIU span 38 years and several SEIU presidents (George Hardy, John Sweeney, Andy Stern, and Mary Kay Henry). Materials related to Burger’s time with SEIU may be found in the SEIU Executive Office: John Sweeney Records. 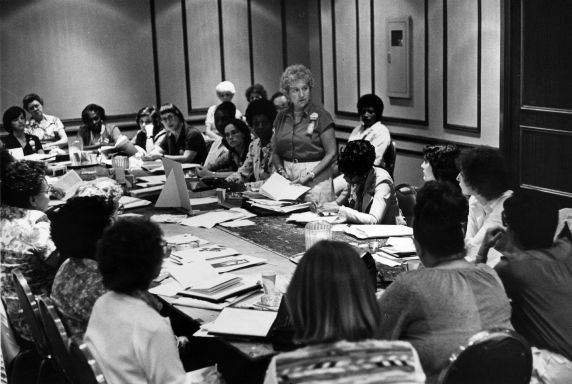 Betty Bednarczyk, Executive Board Member, addressing attendees at the 1984 convention. Burger’s immediate Secretary-Treasurer predecessor, Betty Bednarczyk, was not only the first woman to inhabit this role, but at the time, she was the highest-ranking woman in the International’s history. Bednarczyk’s career with SEIU began with Minnesota Local 113 in 1960 and in 1983 she was elected to the SEIU International Executive Committee. By 1992 she was elected as an International Vice President and her career culminated in 1996 when she became International Secretary-Treasurer. Over the course of her career, Bednarczyk worked on numerous impactful projects and held prominent roles including leader of the 1992 SEIU Committee on the Future, and Minnesota AFL-CIO Vice President. But perhaps her most important contribution was as a mentor and inspiration to other union members and leaders, including current SEIU president, Mary Kay Henry, as noted in Henry’s blog post in memory of Bednarczyk. Mary Kay Henry on the phone in front of a sign reading, "Health Care Our Families Can Afford." Indeed, SEIU’s first female president Mary Kay Henry embodies the diversity and inclusion that has been present in SEIU since its early days. Henry began working at SEIU in 1979 as a Research Specialist. In 1996 Henry was elected to SEIU’s International Executive Board, and she attained the role of International Vice President in 2004. Like many of SEIU’s notable women, a primary component of Henry’s expertise is organizing, and for a time she headed this department at SEIU. Additionally, a major portion of Henry’s career has focused on SEIU’s healthcare division, which she led. Henry was also a co-founder of SEIU’s Lavender Caucus, a group within SEIU promoting and securing LGBT rights. Betty Bednarczyk poses for a photograph with the SEIU Lavender Caucus. Now President Mary Kay Henry may be seen (first person on the left in the back row)." Thus, while women have played a role in SEIU since its origin, their role and visibility have certainly increased over the last century. It is through the work and perseverance of women such as those discussed above, that women in the labor movement are able to play as prominent and critical a role as they do now. Indeed, SEIU’s women helped to expand the rights and freedoms afforded not only to their fellow female union members, but to all SEIU members, and to the greater society. Alexandra Orchard is the Archivist for the Service Employees International Union (SEIU).